Very nice indeed. Good jacket for the buck. Kick your cold-weather style up a notch by covering up with this fashionable double-collared carcoat. Made of smooth leather with flannel lining, this luxurious black carcoat fits snugly thanks to the button front and zip-front closure. Cargo pockets and a breast pocket let you stash your wallet, phone, and small essentials. 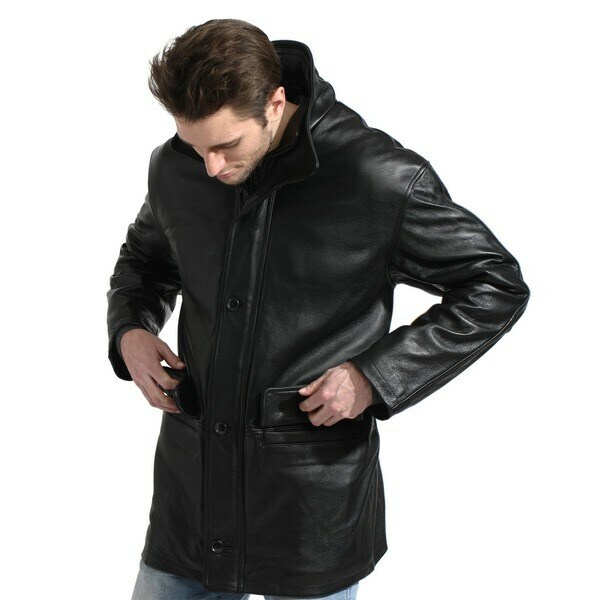 Nice black heavy and durable and fashionable coat. I bought for my boyfriend as a Christmas gift. He will love this coat. The leather is soft and pliable. Not stiff at all. The coat had the features I wanted. The style is what i was looking for, good reviews and good price.